Silverstone saw yet another twist in the application of Red Bull's exhaust package as they added a resonator chamber to the collector. From the picture above trace the path the exhaust takes from the primaries toward the collector (single point where the 4 runners meet) you will see there are two pipes, the one that goes left is the exhaust outlet and the one that continues vertically is the resonator/expansion chamber. Tied in with Red Bull Off Throttle blowing using a chamber like this could smooth the transition from On throttle to totally Off Throttle. When the engine is on throttle the exhaust gas moves through the pipes to the collector at which point it will split to the resonator/expansion chamber and the exhaust outlet. This process continues up until the point whereby the chamber is full and the air inside the chamber at full compression, this then allows the air to move freely to the exhaust outlet. When the drivers comes off the throttle the exhaust gas dissipates and so the air compressed in the chamber flows out through the exhaust outlet. This helps to smooth the transition from on to off throttle minimizing the aerodynamic losses which in turn allows the driver to pick up the throttle earlier as more downforce is available during cornering. 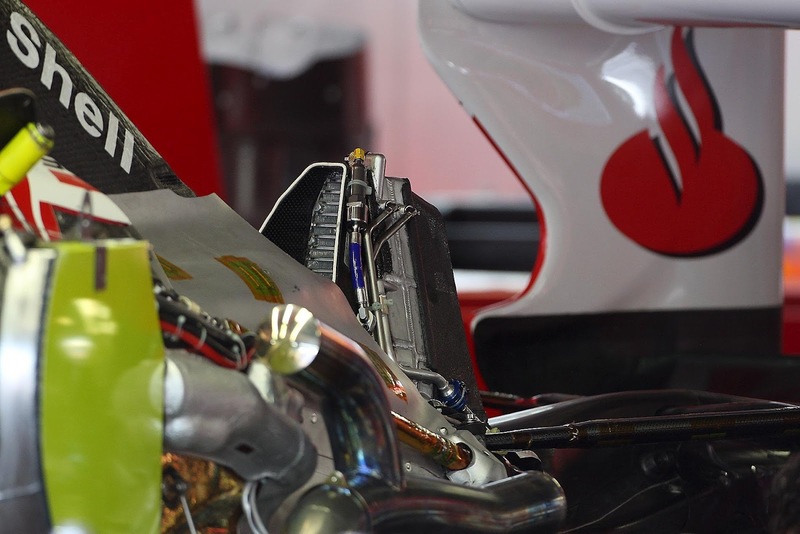 The usage of such a pipe is obviously not something that has been done in haste and will have been tuned to the exact requirements of the Renault engine. Due to the packaging required for the RB8 exhaust ramp exit the tuning length of the exhaust has been compromised, this would lead to a decline in performance during a set rev range. (This is not exclusive to just the RB8's packaging) The use of the resonance chamber allows both an airflow and sound shift further down the exhaust mimicking the effect of larger/longer exhaust runners. Timing the Inlet and Exhaust events could also bore an advantage in terms of scavenging more airflow back into the engine cylinder giving a larger reaction during the engines power cycle. 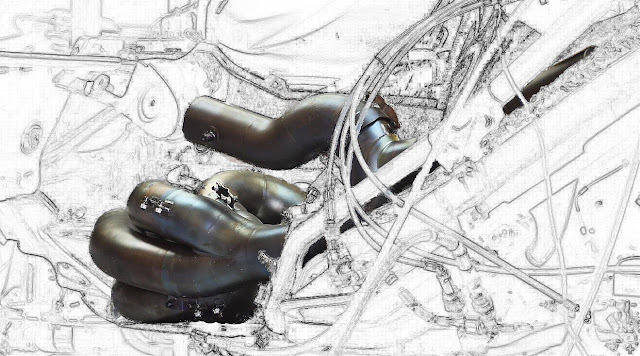 Technically you would leave the exhaust valve open for slightly longer than usual on overrun in order to recapture some of the air from the resonance chamber, this can be reused in the Intake and Compression strokes to give a larger power and exhuast stroke. It is also plausible that the chamber offers further benefits in the shape of the Kadenacy Effect . The Kadenacy Effect is the sound wave created by combustion. As the air leaves the combustion chamber through the exhaust valve a sound wave is part of the airflow (positive wave) when it reaches its outlet a negative wave returns as the exhaust valve closes. Due to the resonance chamber the frequencies involved will be altered and help with the extraction of the gas that would normally be held in the exhaust awaiting the next engine cycle, extracting more airflow than an exhaust the same size but without the resonance chamber. The effectiveness of a well tuned resonance chamber in combination with the now limited off throttle blowing will obviously have a larger effect on the Off Throttle effect than without the chamber. Ferrari have already been using a Resonator / Expansion Chamber this season but I feel theirs is primarily focused at tuning the exhaust length rather than utilising the benefits that can be gained under off throttle events. 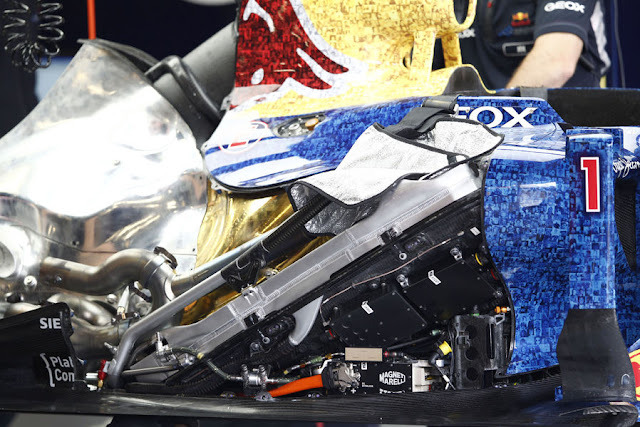 The incorporation of resonators / accumulators is only beneficial if you have an efficient, downforce producing rear floor design ie RBR at present. Hats off to them. In my experience, the length and configuration of the primary pipes coupled to valve timing provides the best way of waste gas extraction. sorry, but the following paragraph is really full of inaccurate things. The term “scavenging” is used for pushing the residual gas in the cylinder out of the cylinder. The moment you want “more airflow back into the engine cylinder”, the piston is near the top dead center, and the intake stroke has just started, so how would you get and why would you want more air from the exhaust side??? I really don´t want to be mean and I know you aim to inform the regular F1 fans, but it is still important to stick the facts. Hey no problem if you feel I have written something incorrectly and we can agree on it then I'll hold my hands up. I've already mentioned above to David that VVT is banned in F1, i'm simply talking about aggressive overlap which as the teams seem to be using cylinder deactivation shouldn't cause too many problems at lower RPM. Thank you for explaining this. The best way to utilize the Resonator is to make it bring out the best in your muffler. Unlike the Ferrari who have been focused on tuning the exhaust length. Otherwise, this is great.Adding of the resonator by Silverstone is yet another reason to take advantage of some powerful exhausts.